The Latina Entrepreneur Academy is a part of LULAC’s Women’s Empowerment (WE) Initiative designed to train, motivate, and inspire women, especially those of Hispanic descent, to build their own businesses or enhance their existing ones. Studies show that since 2013, 1 out of every 10 women-owned businesses are Latina. The Latino community has an entrepreneurial spirit that we see largely in local immigrant communities. Immigrant communities bring much of their culture through food, artisanal items such as clothing and art, and much more. Many individuals turn their passion and culture into businesses that provide many with comforts from home. Through this initiative, we hope to nurture this entrepreneurial spirit and provide support to driven Latinas who seek to launch and/or expand business endeavors. The academy will provide a series of informational sessions on various topics that will better prepare women entering the world of entrepreneurship. Through this initiative, we hope to nurture this entrepreneurial spirit and provide support to driven Latinas who seek to launch and/or expand business endeavors. 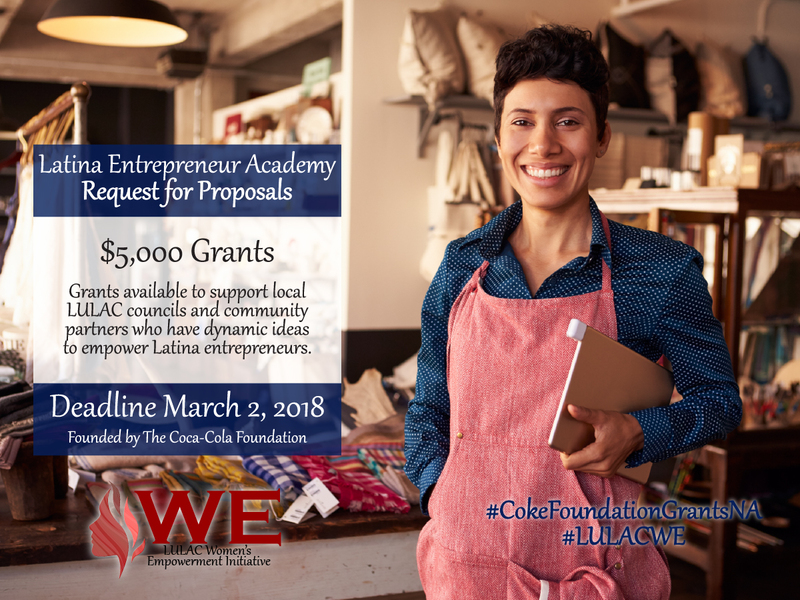 LULAC invites you to submit a request for proposals in order to host a Latina Entrepreneur Academy in your local community. RFPs are due on March 2, 2018 by 6:00pm PST via email to WE@LULAC.org. Six councils and/or community partners will be selected this program year and will be provided with a $5,000 grant.